Looks like we’ve got another sleeper hit for the DS on our hands, in the same vein as Phoenix Wright and Trauma Center. 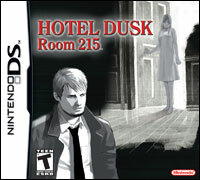 Hotel Dusk: Room 215 has been getting fantastic reviews (one guy gave it a ten in EGM) and some momentum behind it, but by all accounts has had a miniscule print run and is barely being stocked in some places. Buy it while you can. Think of it like a detective novel, not least because you hold it vertically like Brain Training or, perhaps more traditionally, a book (remember those?). The touch screen is used to interact with people and objects, and to write in your notebook by actually writing, which is a smart little touch (no pun intended). The majority of the game involves conversing with characters that famously look like they’re out of the Take On Me video. It almost looks like a pulp graphic novel, and plays like something akin to Phoenix Wright. It’s more sophisticated than everyone’s favourite defence attorney – this was built from the ground up for the DS rather than ported from the GBA, after all – but the fundamentals are similar. Only this time you’re in 1979 as a hard-boiled ex-cop (presumably alcoholic; isn’t everyone in noir?) on the trail of his dead (or is he, etc?) partner in a run-down hotel, rather than a lawyer who only seems to hang around with 16 year-old girls. But let’s not go there. What it really shares with Wright is its reliance on strong writing to carry the story, here enhanced by characters that appear to constantly move and really emote (it uses sporadic colour to convey emotion) rather than cycle through their canned angry face, sad face, and so on as required. I’m hoping that the puzzles won’t be too reliant on dubious leaps of logic that almost seem to be an endemic problem with the genre. Unfortunately it also suffers from an annoyingly common problem in text-based games and a pet peeve of mine since I have a reading age of more than six years old: slow text scrolling speed. How hard is it to let me press a button to jump to the end of the line? For now I’m going to crack on with it and enjoy it as a classic adventure done in a fashion that would be impossible on anything other than the DS. It’s some great eye candy and the latest in the line of unique and well-made DS games.